Located in Carmel, IN, Spa Suites on 116th is an innovative company that not only rents out suites to beauty professionals, but also provides them with extensive business support. This includes design, marketing, business coaching, and a host of other services. Owner Annemarie Greene launched this business model in August 2016, with the goal of creating “a smaller, more personal version of a spa.” Her model also includes customized check-in services using The Receptionist for iPad. “I wanted to find an app for iPad where multiple providers could be listed so that clients could check in and their service providers would be notified right away.” The company currently doesn’t have a live receptionist. So The Receptionist for iPad pulls the majority of the front desk weight, freeing up staff time. In fact, that was Greene’s top priority in seeking out a visitor management system. 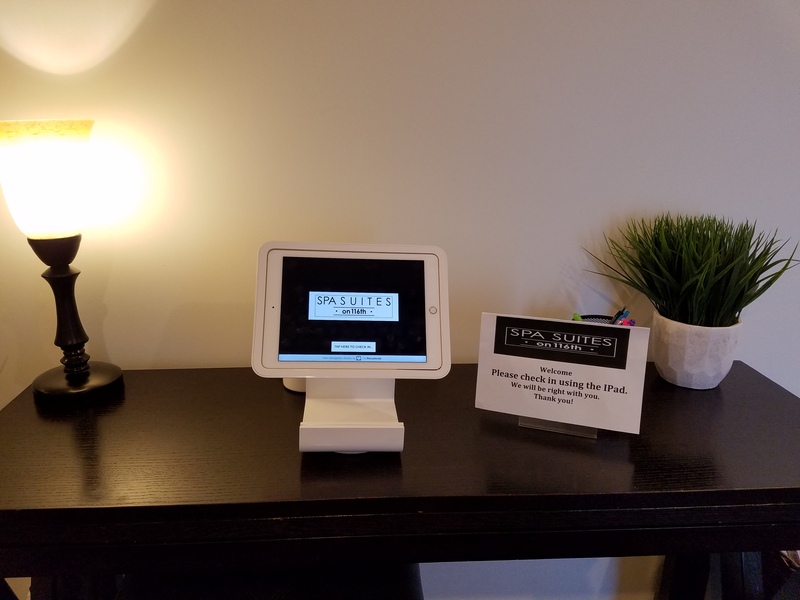 “The biggest reason I wanted it was to streamline the front desk and give my assistant time to work on other things.” One of Greene’s considerations in implementing the system was how guests would react to checking in with a computer, rather than with a person. It’s important to her — and the beauty professionals she works with — that guests have a positive experience from the moment they walk in the door, and she didn’t want them to miss the personal interaction of talking to a live person. As it turns out, they don’t. Her guests love the new system! “It works great, everybody loves it. They think it’s so cool and high-tech, and they wish other places had it.” Greene notes that the two-way messaging function even facilitates interaction, as guests aren’t kept waiting. “When I get a notification, I can text back to let them know I’ll be right there,” she says. We love hearing these stories and feel honored to be included in the office technology stack of creative businesses like Spa Suites on 116th. To learn more about how The Receptionist for iPad can benefit your business, start your free trial today. Spa Suites on 116th is a unique salon and spa experience designed for beauty professionals who want to be empowered to run their own business without the restrictions you find at other salons and spas. We offer an environment that fosters teamwork and collaboration to help each other create and build a business that positively impacts our lives and the lives of our clients.